Assuming your tacho is reading correct, just cruse along at 2.000 revs in 5th gear and see if you need to increase or decrease the speedometer. When you have verified the discrepancy, go back to you garage and remove your speedo. There are two nuts to undo at the back of the instrument before you take the whole Jaeger unit out from the dash. OH, the early original Jaeger tacho has the trip km above the needle and the total under. Later Jaeger tachos had the total over the needle and the trip below. So you know if it is original. This is how I do it. The procedure is for the Jaeger instruments, common on AR Spiders. I have however not tried this on Veglia Borlettis, but I know that they are very similar. Here is a good Pdf file about how to do it, a general description but very useful. Take a thin bladed knife and carefully press around the rear where the ring is crimped to seal. An ordinary screw driver will do too. Do not press too hard, 'cuz you do not want to stress the glass and crack it, oh no. Once the ring is pried far enough all around, the ring and glass will come off. 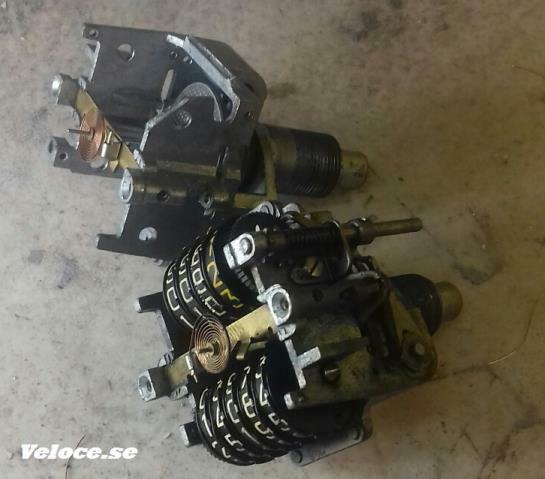 Here's a photo of a dismantled speedo. Now comes the tricky part. Use a small screwdriver and undo the screw holding the reset cable. 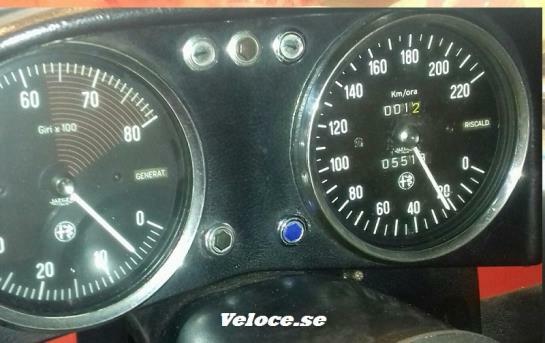 This goes for the old Jaeger speedometer, used on Duettos and early 1750 Veloces, pre 1968. Use some detergent if the screw is stuck. On later Jaeger speedos there is no screw, they made some improvements. If you pull your reset knob, you have a screw, if you press you have the "modern" type without. Good. You need to remove the reset cable arrangement, otherwise you won't get access to adjust the mechanism. Time to get the mechanism out. Remove the two screws supporting the mechanism to the case and remove the unit. Be careful and work with clean hands so you don't end up with fingerprints for the F.B.I. all over the gauge. It is amazing how the sun makes every spot so visible. Go out in the kitchen, yes, in the kitchen, and borrow a suitable electric whisk. I got my hands on one with two beaters, one of them was reversing. You may also use any electric motor as long as it has constant revs and is reversing. 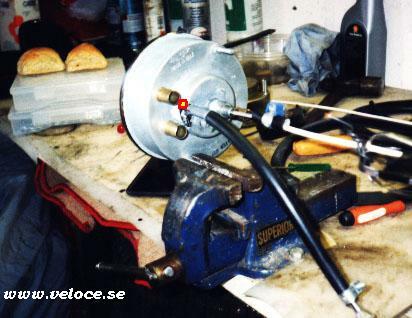 Attach a flexible cable or hose between the motor and the speedo cable connection. 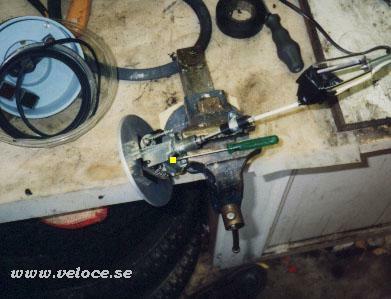 Place the speedo in a vice grip or have your 'spouse to hold it firm and start the motor. Check the speed at the certain rev and remember it. 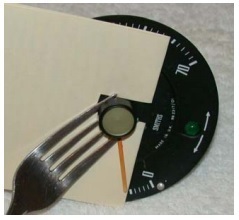 I used a regular fork and a pice of thick paper to remover the needle. Be careful and place the fork where you have support from the mechanism. The screen is made of rather weak aluminium. 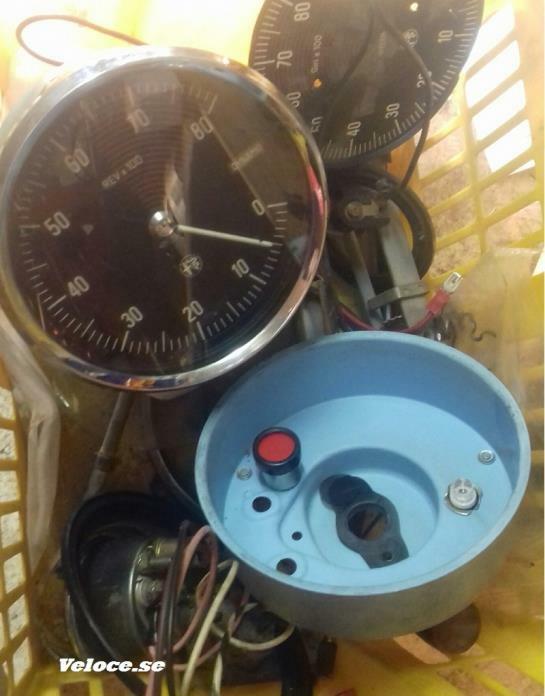 This photo shows a rev counter andd the housing.
. . . and some of my speedos, they are all Jaeger The one with two warning lights, Generatore and RFiscaldatore is from a "Bertone". They are the same except for the warning lights. The Duetto had only one, Riscaldatore. Nobody will notice anyway. The Jaeger in the photo has the total above the needle, that means it is a later Jaeger. This is my Jaeger tacho in my Duetto. 2018 March 15. Nice You may see that the trip odo is above the needle, this is a very original and old Jaeger on my Duetto. 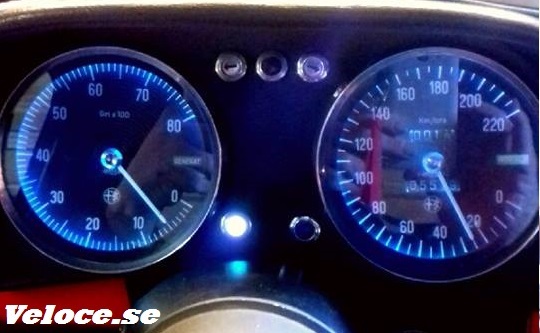 I have LED bulbs to illuminate my Jaeger gauges. Nice. The crimping of the bearing supports the tachometer (rev counter) needle. This adjusts the distance of the aluminium disk from the spinning magnet and hence the force by the eddy current. Start your electrical whisk at the same revs and check the speed. Then re-adjust the screw until you're satisfied. My first Jaeger started reading 55 kph and after two turns on the screw it was reading 40 kph. The second Jaeger started at 50 kph and needed one turn to drop to 40 kph, so you may need to do it by trial-and-error. Since I had my instruments apart, I drilled a hole in the case to get easier access to the adjusting screw. Do not use the drill unless the instrument is dismantled. 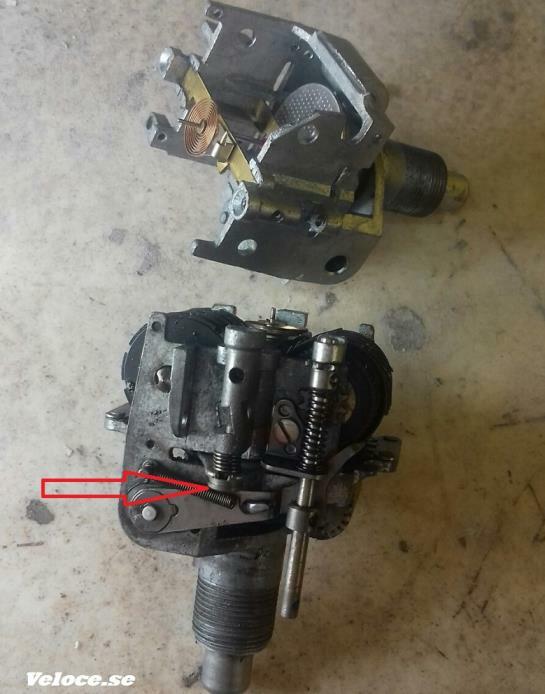 Reassembly is the reverse of removal. Now it's time to put the speed back again. 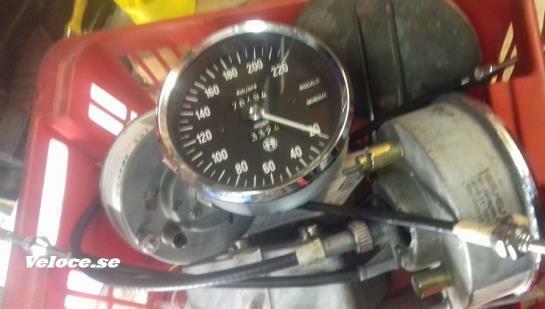 Do not waist your time at this stage, just connect the cable to the instrument, start the engine and make a test drive. If everything is OK, then connect the wiring etc. and tighten the nuts. If the reading is still inaccurate, do it all over again.